Canadian Minister of Foreign Affairs Stéphane Dion announced his intention to raise human rights concerns with Saudi officials during his upcoming visit to Riyadh on 25 May 2016. His trip is part of a regional fact-finding mission that also includes Tunisia and Egypt. He plans to press for the release of Saudi blogger Raif Badawi, and will also relay Canada’s opposition to Saudi Arabia’s use of Canadian-made light armored vehicles against its Shia civilians. The undersigned organizations welcome Minister Dion’s commitment to upholding the principles of human rights and urge him to condemn the Saudi government’s practices. 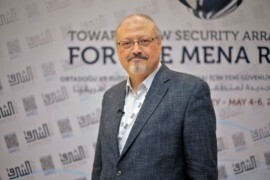 In particular, we hope that the foreign affairs minister raises concerns related to Saudi Arabia’s use of excessive military and police force against its population, including peaceful demonstrators and opponents to the regime. The government uses lofty prison sentences in its suppression of civilian dissent, and Saudi courts administer the death penalty for non lethal charges, such as apostasy. We also ask the Canadian foreign affairs minister to pressure the Saudi government to stop all discrimination against the Shia minority in the Eastern Province of Saudi Arabia, where the peaceful Saudi Shia cleric and human rights advocate Nimr Al-Nimr lived prior to his imprisonment and execution by Saudi forces on 2 January 2016, along with 46 others. We additionally invite Minister Dion to visit the Eastern Province in order to gauge the levels of discrimination and inequality that confront members of the Shia community in that region. Ali Adubisi, director of the Berlin-based European-Saudi Organization for Human Rights, stated, “Saudi authorities have deployed armoured vehicles against Shia civilians in Eastern Province more than 15 times since 2011.” A recent video released by activists in Al-Qatif displays one such occasion where Saudi forces utilized such weaponry against Eastern Province Shia’s population. The Canadian government plans to sell $15 billion worth of arms to Saudi Arabia over the coming years. There is substantial reason to believe these arms will be either directly or indirectly used to repress peaceful dissent in Saudi’s Eastern Province and against Saudi citizens in general. Collectively, the undersigned NGOs ask Minister Dion to use Canada’s influence to bring about peaceful reform in Saudi Arabia. We urge Canada to use the 15-billion dollar arms deal as a bargaining chip to steer the Kingdom’s Human Rights policy in a direction benefitting Canada’s tradition of upholding justice, equality and pluralism.